Markham, VA is about 15 minutes from the Prince William County/Fauquier line, and it’s the location of two fruit orchards. In the past, we’ve always gotten off 66 at the Markham exit and turned right to go to Hartland Orchard, which we love for apples and peaches, especially. However, this fall we got to check out Stribling, too! Last Friday, though, our friends invited us to break with tradition and hang a left over to Stribling Orchard. This involved a fun hairpin turn and some railroad tracks, which my kids thought were fantastic. Hooray for adventures. Stribling Orchard is a lovely location with a long gravel driveway up to some very historic looking buildings on the left side. A friend who came with us said that you can arrange an educational tour and they take you around the property. Incidentally, we saw Christ Chapel Academy (also from Woodbridge!) there enjoying a tour! Like every orchard we’ve ever been to, you have the option to drive your car right up into the fields to pick your fruit, or you can park by the checkout area (in this case, an actual storefront) and hoof it on up. There are also lovely picnic areas around the property for those who would like to pack a lunch. I typically wait until October to go apple picking, since some of my favorite varieties aren’t ready until later in the season, including Granny Smiths, which I use for my Thanksgiving pies. Yum! However, even in September you can get some delicious eating apples (especially if you’re a fan of the red varieties). Picking baskets are located on the side of the main building near the bathrooms and are a big help for shorter pickers!! The staff was friendly and helpful, and gave out maps. The trees here are a little more mixed than at most locations we’ve picked fruit at, but the trunks are typically marked with spray paint to indicate the variety, and using the guide on your map you can determine what looks good for eating. Stribling was lovely, and I love that they offer tours, but the prices were much higher than we were used to, and the apples were coated with white film from the pesticide. (I know we’re not paying for organic, but I still don’t want to see whitish apples!) However, I know many people love this orchard and go every year! $25 a half bushel is steep for me, because with 3 kids picking, we usually leave with APPLES! Typically we pick a bushel and a half when we go, although this particular day we only did one half-bushel because $75 of apples isn’t happening! I did appreciate that Stribling takes Visa/Mastercard/Discover because most orchards take only cash or checks, and it’s nice to not have to remember to stop at the ATM! Local cider and honey are available, too. Hartland Orchard is our go-to pick your own place. 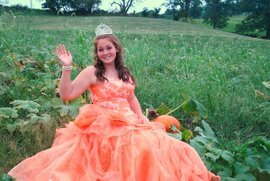 In the fall, they also have a corn maze, pumpkin fairy, pumpkin chunking and more. I didn’t realize it before visiting another orchard, but at $12 a half bushel, I love them for their prices. A lot. Our typical bushel and a half of apples here is $36. Whoohoo! The pumpkin fairy, from HartlandOrchard.com. The pumpkin fairy is available to visit most weekends, and Hartland is great about answering their phones if you want to call and check before leaving. 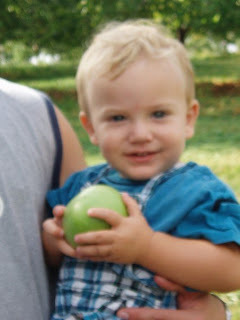 This is the same little guy working the apple-picker in the Stribling pictures his first time picking apples at Hartland. He was 18 months old and had a grand old time on daddy’s shoulders. The only problem with apple picking (especially at $12/half bushel) is what to do with all those apples!! We peel, slice, and freeze a lot of ours to use in crisps or pies all winter (pre-measure into Ziplock bags for your favorite recipes! ), and we also make applesauce (mix up a bunch of varieties in the crock pot with 1/2 cup of OJ or Apple Juice/Cider, a cinnamon stick, and sweetener of choice if your want it on low until everything is soft and delicious!) Another favorite in our family is chicken salad with red and green apples, pecans, celery, onions, craisins, and raisins. Yummy! 4) Pack a picnic and make a day of it! 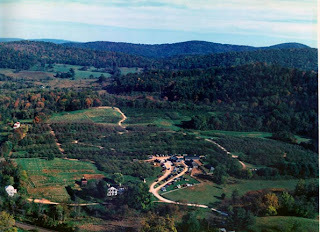 Do you have a favorite apple orchard to use? Perhaps a favorite apple recipe? Share in a comment below! These reviews were unsolicited and represent the views of PwcMoms.com only.